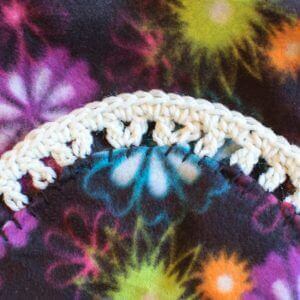 This easy crochet edging pattern is a super quick way to add a personal and handmade touch to any piece of fleece or fabric … perfect for a last minute gift or for making items and loveys to donate! If the fabric already has a blanket stitch around it, just work into the tops of the stitches. If there is no stitching around it, no worries at all … check out my post here on how to prep your fabric to crochet a border. Got your fabric? Ready to get started? 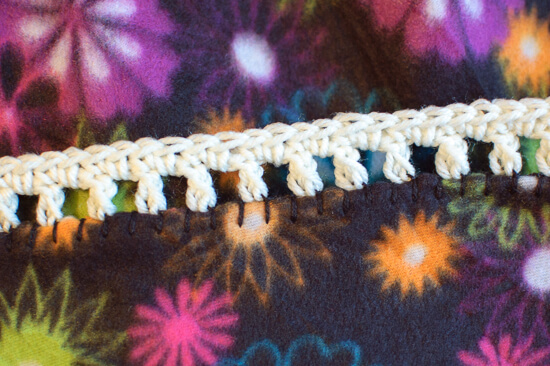 Round 1: Join yarn in any blanket stitch along edge of fabric (see here to add your own), ch 4 (counts as 1 dc and 1 ch), skip next blanket stitch, *1 dc in next blanket stitch, ch 1, skip next blanket stitch, rep from * around, working [1 dc, ch 1, 1 dc], ch 1, skip next blanket stitch around corners (Note: you may need to adjust how you work your corners depending on the degree of curve you have to your blanket’s corners), join. Click here for more quick and easy (and free!) 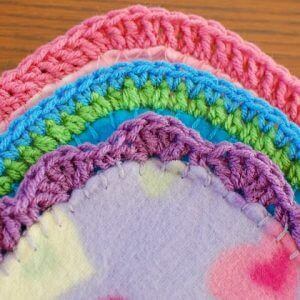 blanket edging patterns. What a fantastic idea! Fleece is often on sale, and this gives it a special, homemade touch for a relatively easy handmade gift. It would be a great baby shower gift. I love your blog – it’s so inspirational! Thank you! thank you for all the help full tips. I just a beginner, this site helps me a lot.